On January 16, 1919, the 18th Amendment to the U.S. Constitution was ratified, banning the manufacture, sale and transportation of alcohol (Prohibition), including beer made at home. 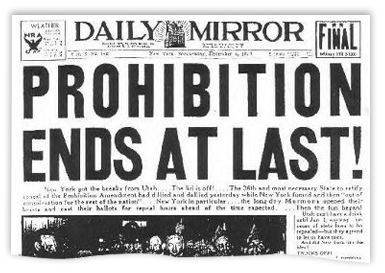 The 21st Amendment repealed Prohibition in 1933, however, the repeal’s legislation mistakenly left out the legalization of home beer making (home wine making was legalized at that time). On October 14, 1978, President Jimmy Carter signed H.R. 1337, which contained an amendment sponsored by Senator Alan Cranston (D-CA) creating an exemption from taxation of beer brewed at home for personal or family use. This exemption went into effect on February 1, 1979, making homebrewing legal on a federal level in the U.S. Although homebrewing is legal on both the federal and state levels in the U.S., the 21st Amendment predominantly leaves regulation of alcohol to the individual states. Thus each states’ laws regarding homebrewing vary widely. Some states have very specific laws that outline exactly what can and cannot be done with homebrew, while others are vague. Some states limit consumption of homebrew solely to the residence where it was brewed, while others allow for transportation of homebrew to events such as competitions and club meetings. Mississippi and Alabama were the last two states to legalize homebrewing. Alabama law went into effect on May 9, 2013, and the Mississippi law went into effect on July 1, 2013. The American Homebrewers Association (AHA) does not have the resources to maintain a lobbyist in each state, however the AHA can assist homebrewing communities organize effective grassroots campaigns to enact new laws or update existing laws. When acting as a community, homebrewers have strength in numbers to enact change. Use the AHA database to check current laws for homebrewing in your state. Identify the legislative issue to be address (e.g. homebrew cannot be served outside the home where it was brewed). Determine if pursuing legislative change is worth the inherent risk and scrutiny that attempting the change the law will bring. For example, if it is technically not legal to share homebrew at a club meeting in your state, but there has been no enforcement of that law, it may not be worth pursuing as there’s no guarantee of the outcome and could take years to accomplish. Contact the AHA for information on any past or current legislative efforts in your state. Contact homebrewers and homebrew clubs in your state to let them know your intensions, and request their support in the effort. Form an email distribution list (free from Google or Yahoo) for representatives from your state’s homebrew clubs and homebrew shops to facilitate communication and develop a consensus on strategy and tactics. Find a sympathetic legislator who will sponsor your bill (it is preferable to have sponsors in both the House and Senate if possible). Lining up a sponsor prior to the start of the next legislative session will give you the best chance of getting legislation through the often frustratingly slow legislative process. The AHA can help with drafting language for a bill. Once the bill is registered, the AHA can help mobilize AHA members, BA brewery members and the Support Your Local Brewery network to contact legislators urging support for the bill. AHA staff is available to testify on behalf of the bill during legislative committee hearings. The AHA can help generate media attention for the bill. Note: The information presented here is not substitute for legal advice specific to the laws of your state. Want to enjoy exclusive access to member-only content and more? Join the American Homebrewers Association or start your 30-day free trial (no payment necessary) today! Forgot username or password? or First time logging in? Built for homebrewers and beer lovers, Brew Guru delivers homebrew recipes, money-saving deals and local info on breweries, beer bars and homebrew supply shops. Follow the path to good beer! Start your 30-day free trial and enjoy AHA member benefits. No payment information required. 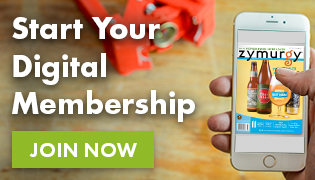 Download Brew Guru and Get a FREE Trial Membership! Start your 30-day trial and enjoy AHA member benefits. No payment information required.